There are two letters I am posting today. Both from my cousin Regina. She is on a medical mission sponsored by Caritas Christi. She and her group left for Haiti January 28. She is asking for prayers…..I will forward your comments to her. I know she and the medical team she is with will appreciate the moral support. words to describe what my eyes have seen and my heart has felt. The gravity of destruction to a generation of this country is beyond words. So many of the children without limbs simply take my breath away. I have one little boy, Raymond, who I’ve grown very attached. While trying to comfort him just after he came out of surgery, I was told by the doc that he was all alone. He was recovered in the rubble in Port Au Prince and his family is presumed dead.Hearing that, I scooped him up in my arms and just couldn’t hold back the tears. He kept looking at his bandaged shoulder stump and saying in Creole “All gone? All gone?”Oh, how I wish I could bring him home. And sadly, there are many others like Raymond. Our days have been very long. We start work at 8am and finish anywhere from 10p-2a. 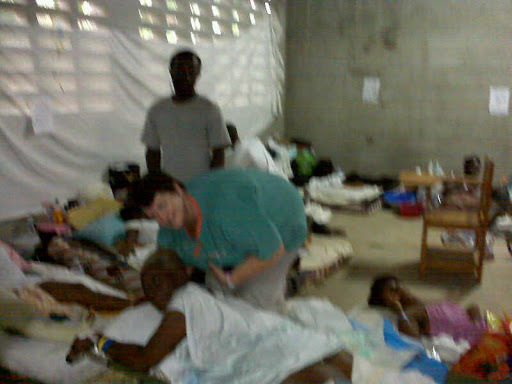 We are taking care of patients that are laying on mattresses on the floor and army cots. We kneel or squat to reach them. The rooms are filthy and all of us nurses have had difficulty caring for our pts in such unsanitary conditions. We do our absolute best, to practice aseptically, as we would at home, but truthfully, it is next to impossible. We often crack jokes about JHACO!! Needless to say, I’ll need a full body massage when I get home. Oh, and throw in a pedicure too. My feet are swollen and blistered. Chairs are a commodity here. Any available seats are occupied by the family members who have no where to go, so they stay in the pts wards. Just more people to add to the chaos! We are doing so much good here. Although I’ve never been so physically + emotionally drained, I am so glad that I came. I knew it’d be grueling, but I didn’t expect to have the feeling of sadness that I’ve experienced. To look in the eyes of these people, you sense an emptiness. They had so little to begin with and now they have nothing. And, then there are their families who do not hesitate to provide the most intimate of care. Not only do they help their own, but also those who are without families. It is a culture that really looks out for the little guy. And they are so grateful for our presence. In spite of their agonizing conditions, they kiss our hands and pat our backs in gratitude. I just hope that in the months to come these victims will get the rehab they need to learn the necessary skills to have some quality of life with their handicaps. Looking around at the infrastructure of this 3rd World country, it is certainly hard to fathom. The Caritas contingent is highly regarded down here. I love telling the other volunteers that I’m from Boston. They respond with “oh, Caritas has been so responsive to this mission…and then they thank us on bended knee. It gives us all such a sense of pride. And thank you Caritas for providing us with Blackberries to keep in touch with our families. I’d never get through this overwhelming experience without hearing the voices of Colin, Andrew and Mary Kate. Their support and encouragement have kept me going. I haven’t had a lot of time to take pictures, but I will get some soon and send them out. Please keep us all in your prayers. There is very little rest here and we desperately need the support of prayer to keep us going. Rita was on her way to Confession when the earthquake occured. Her legs were trapped under cinder blocks for 6 days when American soldiers found her and came to her rescue. There were 4 other women with her and a 10 year old girl. She helplessly watched and listened to them die. In this picture, I have just finished changing the dressings of her bilateral above the knee amputations. An agonizing ordeal for her. Also, a team of us had just moved her from a straw mat on the floor to an army cot and I’m very happy to report that we’ve since received a few new beds and Rita is now recuperating in luxury….in an honest to goodness real bed!! However, there is no linen to be found, so we became creative and fashioned bed sheets out of rags! Rita has an amazing spirit and is a role model for the other patients. What a great source for coping skills and surviving life’s tragedies. She has not heard from her grandsons since the quake. Her older sister lives on the outskirts of Port Au Prince and Rita feels very fortunate to have a place to go when she is physically able.